Come raft the Colorado River with us! 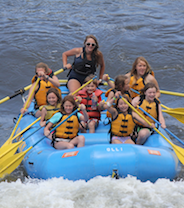 Campers will be taught to navigate different levels of whitewater with experienced Ajax Adventure Camp counselors and Blue Sky Outfitters raft guides. Campers will get the chance to jump in the river, ride on the stern of the raft and get soaked in the rapids. We put in at or below Shoshone rapids, depending on water levels. The maximum size rapid is class III. Any age welcome. Please note: Due to the fact that this activity starts in Glenwood Springs this full-day activity is offered twice per week. We ask that you please reserve a space online for a Rafting day if you would like to participate.